Canon AF Settings for Birds in Flight … an illustrated e-mail Guide: $10. Free with proof of purchase of any BAA Camera Users Guide. As most of you know, I struggled for years with choosing which AF Area Selection mode to use for birds in flight, which AF point to select, and what settings to use for the three parameters in the case settings. Ironically, right before I switched to Nikon I tried something new and found that it worked like a charm. I was able to get sequences of sharp flight images with both my EOS 5D Mark IV and my EOS-1DX Mark II camera bodies. I will share these new setting with you via a short e-mail that includes seven screen captures. 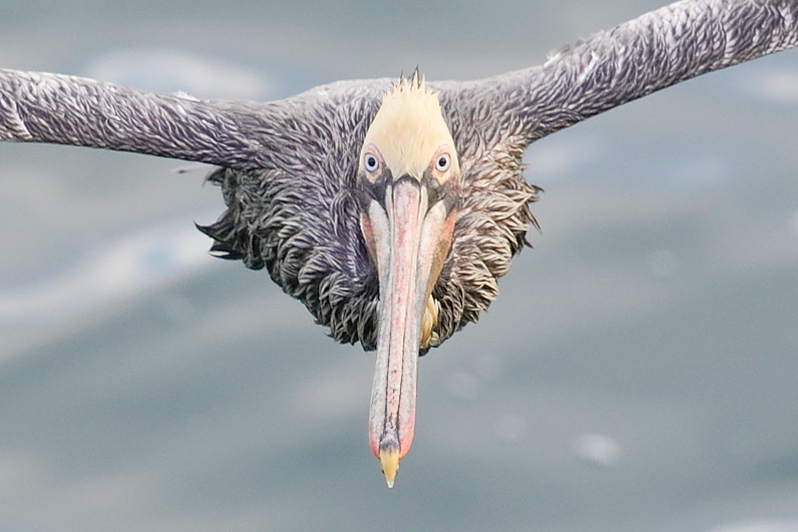 The pelican image here is an unsharpened 100% crop of an image made with the 100-400 II and the 5D Mark IV. If you previously purchased any of my Camera User’s Guides and would like to get a free copy of the new AF Setting E-mail Guide, you must follow these simple directions carefully: send an e-mail to Jim at staffbaa@att.net and include either your original receipt or a cut and paste of the cover or page 1 of the guide. Please note: You will receive your file via e-mail the same or next business day. Click the button below to add the Canon AF Settings for Birds in Flight to your wish list.